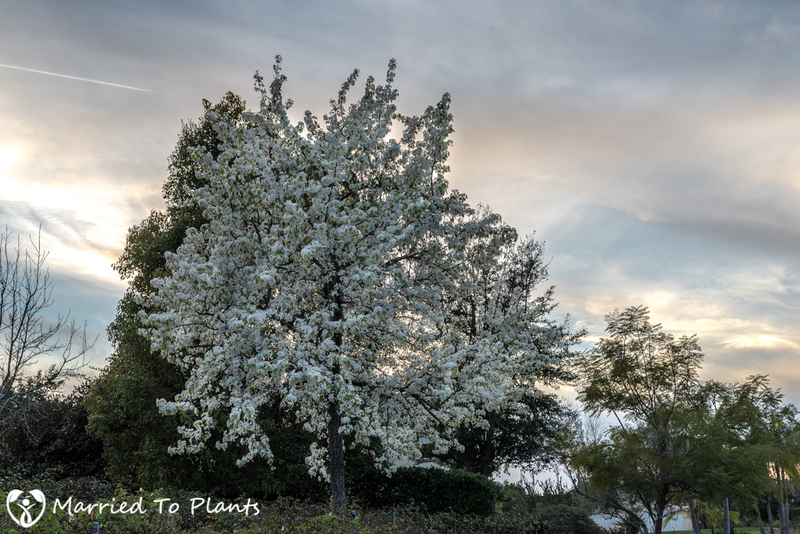 “What is this white-flowering tree I see all over Southern California right now? 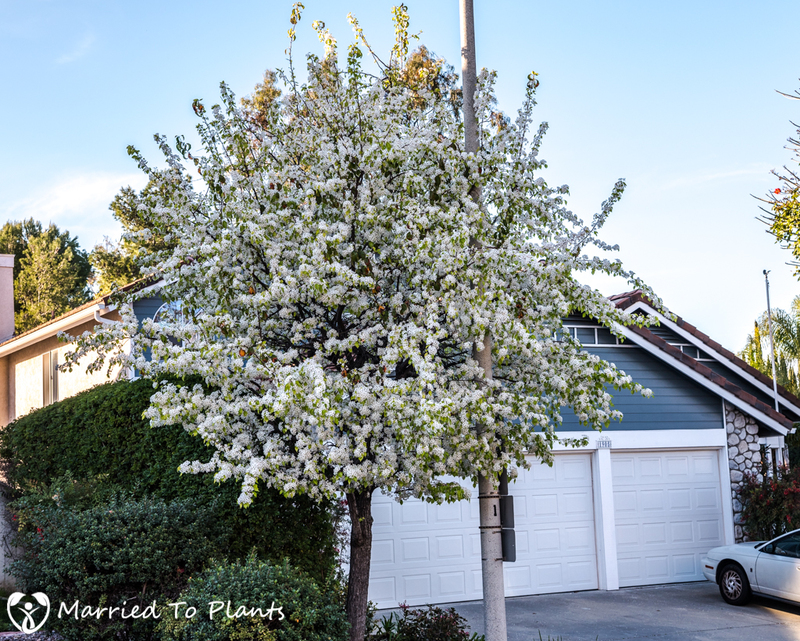 Cherry tree of some sort?” This is usually how it goes when you first see the impressive blooms of the Evergreen Pear Tree (Pyrus kawakami). 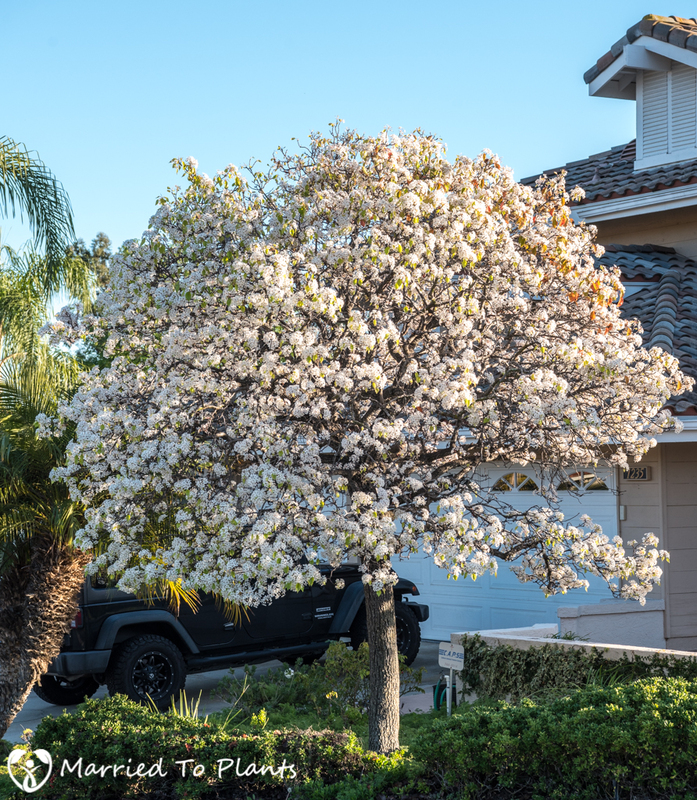 When in flower, you just can’t miss this popular landscape tree that can be found planted throughout coastal and southern California. A few pictures of trees from around my neighborhood. 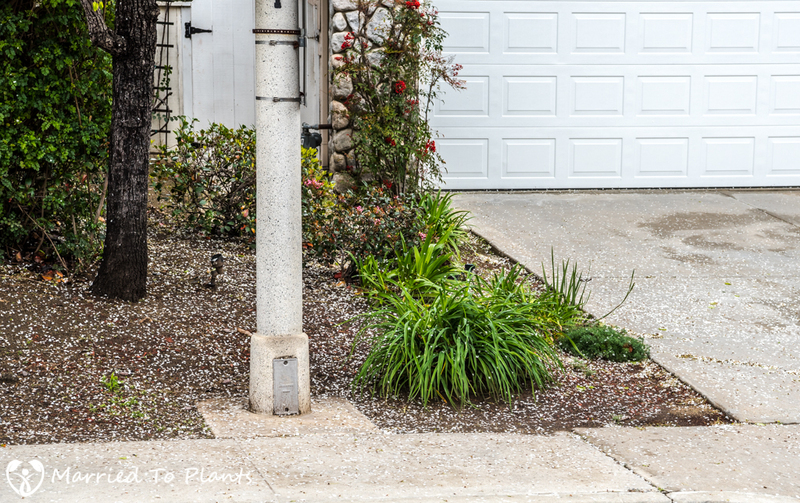 Snow in San Diego? Nope, just the flower litter from the tree above. 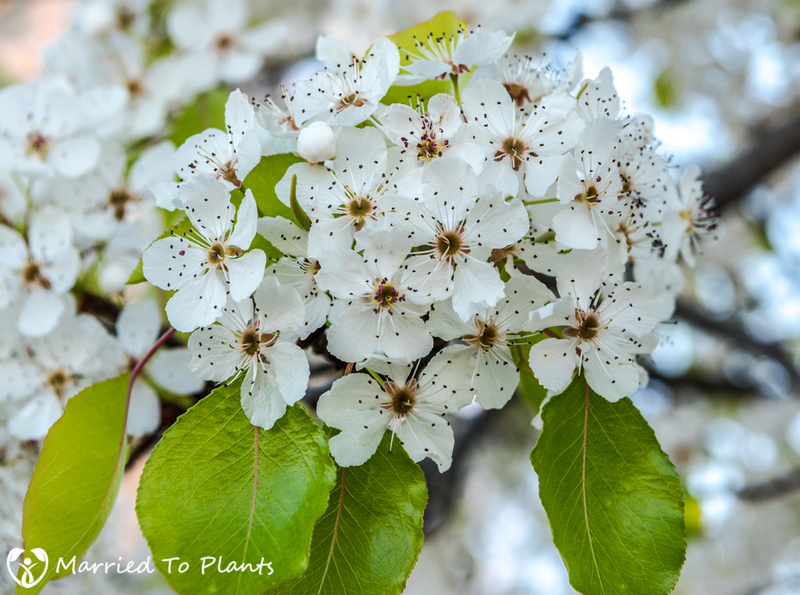 Pyrus kawakami has the common name of the Evergreen Pear Tree. However, that is really just a misnomer. It is really a semi-deciduous tree. 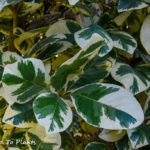 It has a USDA Hardiness Zone rating of 8-10 and in the warmer parts of California it will only drop its leaves when flowering and making new leaves in late winter. In colder parts of its growing range that can see frost and freezes, it will drop its leaves much earlier. In some cases the winter foliage can turn red. Because it can handle some cold, it carries with it the characteristic of a fast flowering period. So enjoy scenes like this below while they last. Peak flowering lasts but a few days! The Evergreen Pear Tree is a pretty dang unruly tree. Wayward in its growth, it can form a low and spreading canopy if left to its own devices. 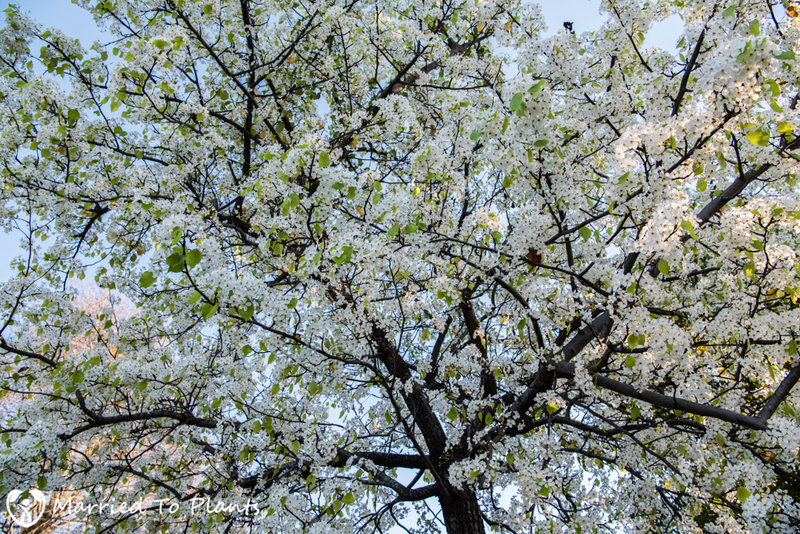 Pyrus kawakami can grow up to 30 feet high and spread out just as far. 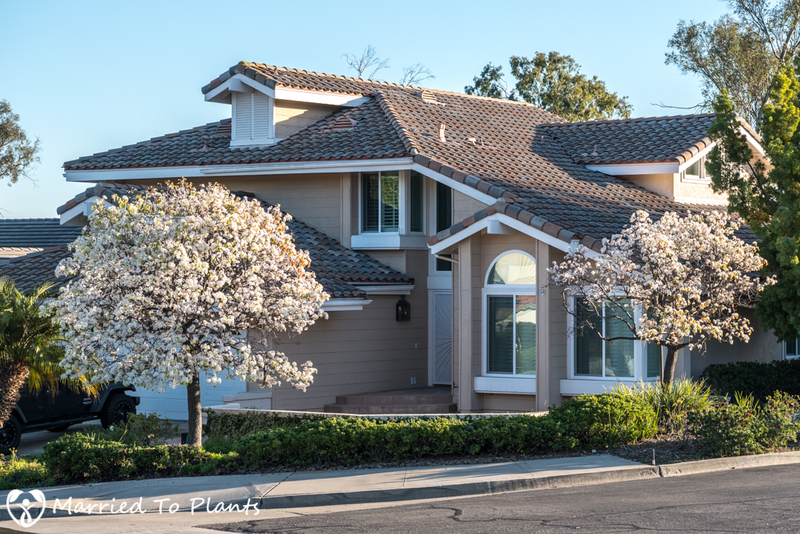 To get a nicely shaped tree, you will need to do a lot of preventative and corrective pruning. When done right, you can marvel in the unruliness of the branches while sitting under it. When done poorly like the topped tree in the photo below, you get an ugly, stunted lollipop of a tree. This one just finished flowering and is leafing out. 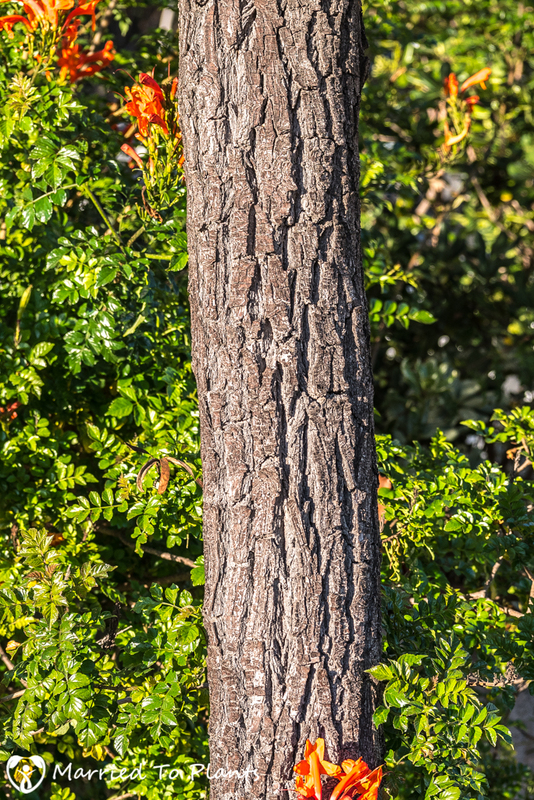 Even in its youth, the bark of Pyrus kawakami is rough and noticeably corrugated. Before continuing, I should probably answer a question that I know has been brewing since you started reading about Pyrus kawakami in this post. “Does it have edible fruit like the pears I buy in a store?” No. The fruit is actually small and inedible. Edible pears are of course in the same genus Pyrus, and the reason this species has the common name the Evergreen Pear Tree. Being in the same genus as the edible pear, you would expect the flowers to be similar, which of course they are. For me, I don’t notice much of a scent from the flower. Nothing like the strong scent its deciduous, cold-hardy cousin Pyrus calleryana can give off. The Evergreen Pear Tree is generally a hardy tree. However, it does suffer from a few really annoying diseases. The two most common are fireblight and leaf spot fungus. 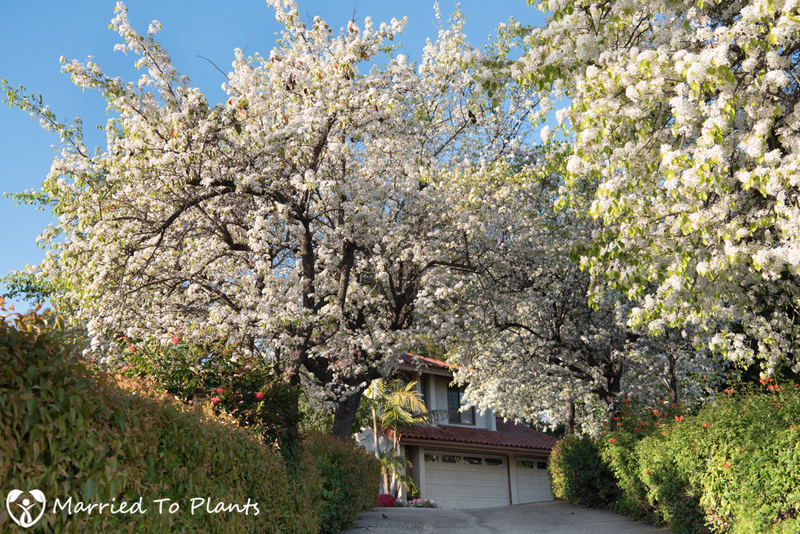 In fact, it is because of these diseases that many landscapers have shied away from planting them, and you just don’t see new plantings of Pyrus kawakami like you would have in, let’s say, the 1990s. All these pictures you see in this post were just from a radius of a few small blocks around a neighborhood close to my house that was built in the late ’90s. 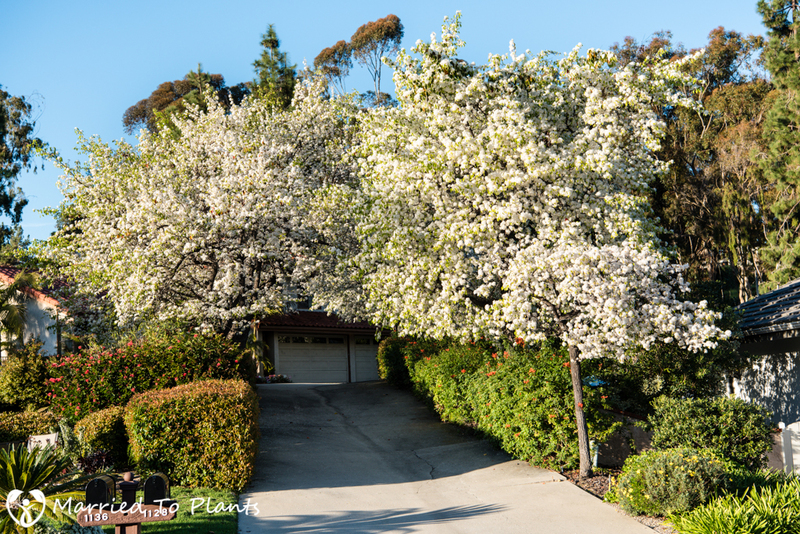 It is easily the most abundantly planted tree in that large neighborhood. Fireblight and leaf spot fungus isn’t found as much nowadays because nurseries and landscapers have gotten wiser to its planting needs. 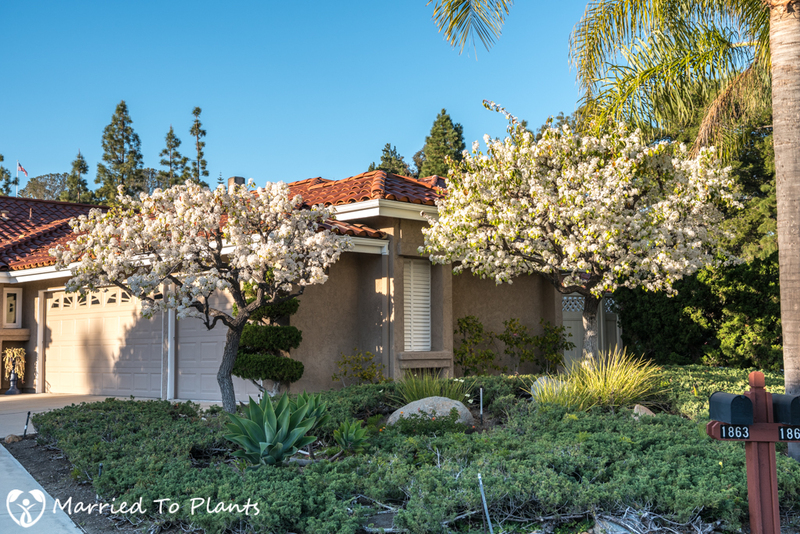 Keep the Evergreen Pear Tree out of foggy coastal parts of California and avoid rainy spring locations, and you shouldn’t have many issues. The only pest that can be a problem on the Evergreen Pear Tree are the aphids. They love attacking weaker plants or those over-fertilized with nitrogen. 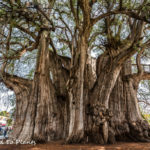 Of course the sooty mold that follows an aphid attack can lead to unsightly growth on the tree or sticky surfaces of things parked or growing under the infected tree. 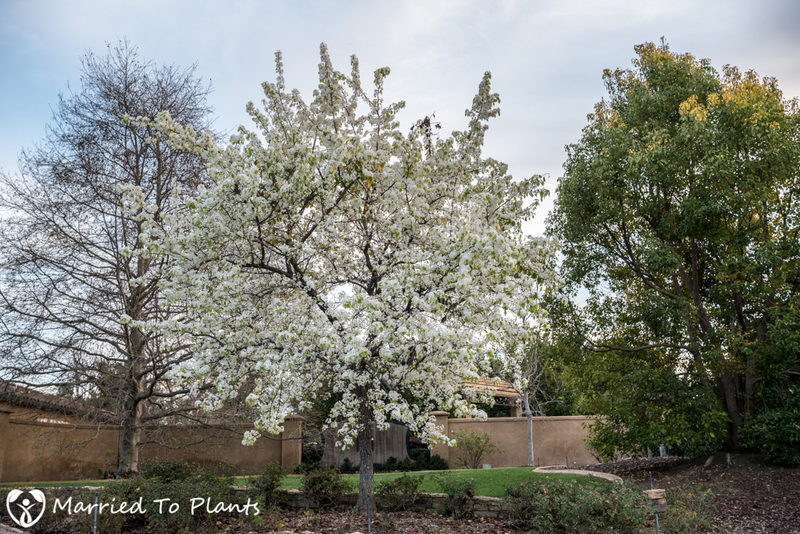 While not a plant for my garden, the Evergreen Pear really is a great tree. It grows rapidly, is hardy down to 15° F, is pretty much evergreen, and of course, as shown in this post, it has an incredible floral display around March. 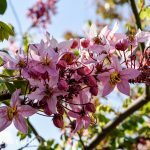 However, unless you get a picture of one in flower, you only have a brief period of time to marvel at it in bloom. It’s one of those plants you can thoroughly enjoy in other people’s gardens for 10 days a year (Wisteria! ), but you’d never plant it in your own. I tend to think of this as a January-February bloomer here in Berkeley. Up here it was probably at peak of popularity in the 1970’s. 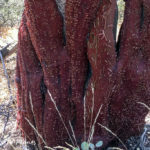 It does have the amazing ability to look old even while young, due to the arching habit and ancient looking bark. David, same species or the deciduous Calleryana? Even up north in Fresno, these are semi-decidious. Some years they are evergreen, and to they are reliable for that fire-engine red color in the fall to boot. The only downside is they seem to be a magnet host plant for mistletoe here. 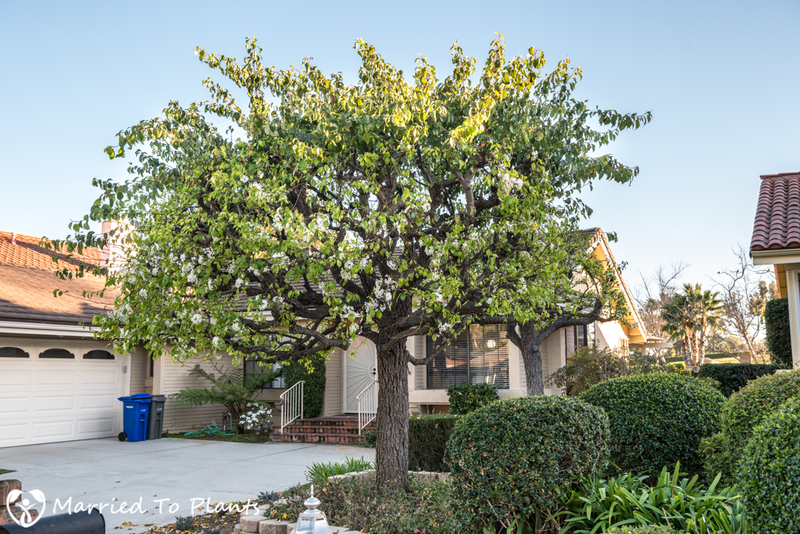 Is it too late to prune my Evergreen Pear Tree? What is the recommended time to prune it. I thought around the end of November, but I don’t know for sure. I don’t want to prune it and not have blossoms. Linda, I would trim it now.